Here on the Carpetbagger I spend a lot of time talking about various locations in the South. One thing that is seemingly missing is the vast amount of natural beauty that exists here. One may think that I am not a fan of nature, but I assure you this is not the case. I love nature, visiting natural places and seeing natural things. However, I am not very good a nature photography, as I have previously documented. Now, that being said, I wanted to take a look at two of my favorite places on the east coast: Bull's Island and Edisto Island. 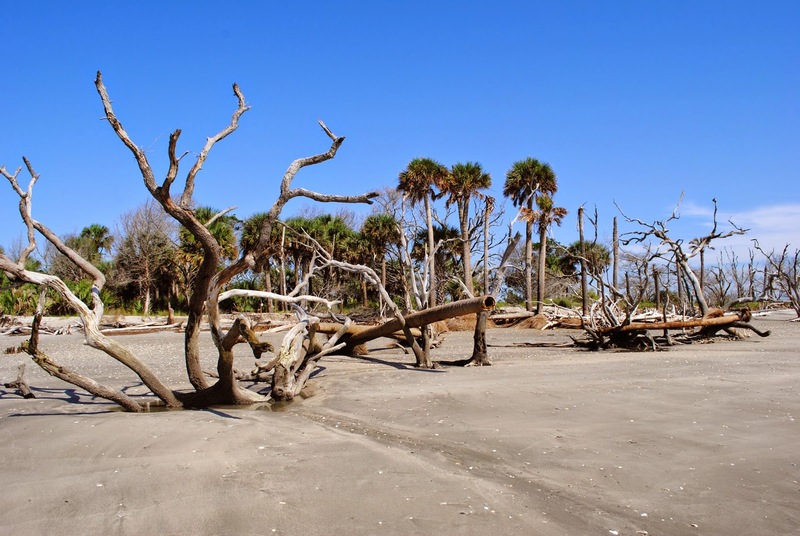 Both these islands are off the coast of South Carolina and both feature a fascinating geographical feature: Boneyard Beaches. What is a Boneyard Beach? 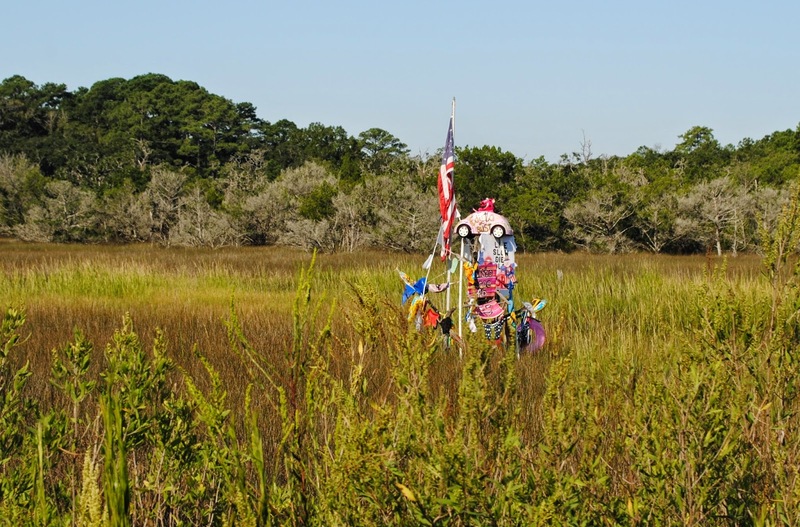 Simply put, a Boneyard beach is a maritime forest the is being eroded into the ocean. The Atlantic ocean eats into the forest, stripping away its soil and killing the trees. This creates a unique environment that is part forest, part swamp, part ocean and part dessert. The best of all worlds. It also creates an eerily beautiful beach. First we take a look at Bull's Island. This island can only be accessed by boat, which makes it a bit inconvenient to reach, but gives you the possibility to spot a pod of dolphins on the way over. Again, I wasn't kidding when I said I sucked at nature photography. 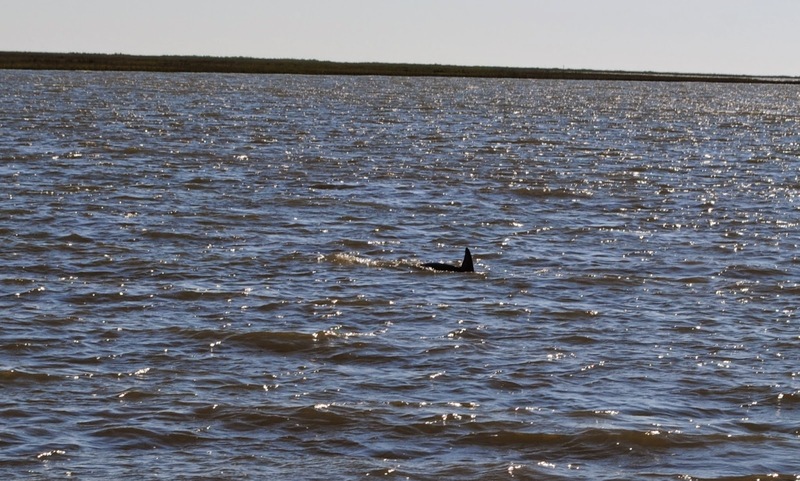 Regardless, I am always enamored by dolphins and still feel like I am watching a unicorn when I see them in the wild. Upon arriving at Bull's island you are treated to some amazingly large Live Oaks. Bull's Island is not for the weak of heart. Its a three mile round trip walk to the beach. Fortunately, you can take a walk through the notorious Alligator Alley. And they arn't kidding. The place is absolutely crawling with gators. As I have mentioned before. I am obsessed with gators. Check out the five different gators in this one shot. At the end of the trail you finally make it to the breathtaking Boneyard Beach. As I said, its a fascinating clash of environments. There are even some cacti growing along the outside of the beach. But of course, the most fascinating thing is the legions of dead trees littering the beach. Bull's Island also has some of the best shelling I have ever personally seen. Me and my family were apple to literally grab handfuls of whelk shells and sand dollars. We also came across Horseshoe Crab shell as big as a manhole cover. We would have taken it with us, but it was to giant and smelly. Now, head about an hour South and you will come to a similarly fascinating environment on Edisto Island. 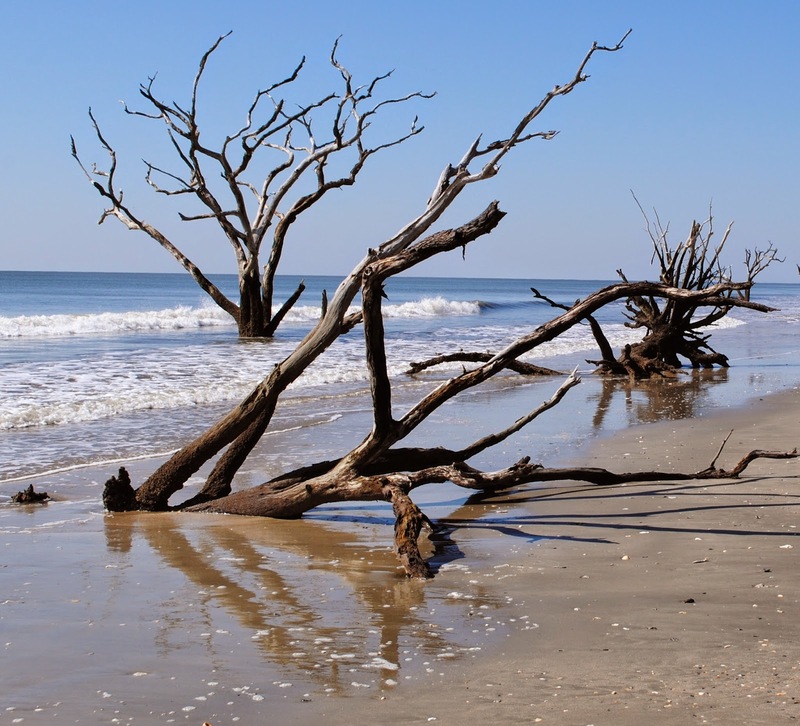 Edisto is much more accessible then Bull's island, in that you do not need a boat to get there. 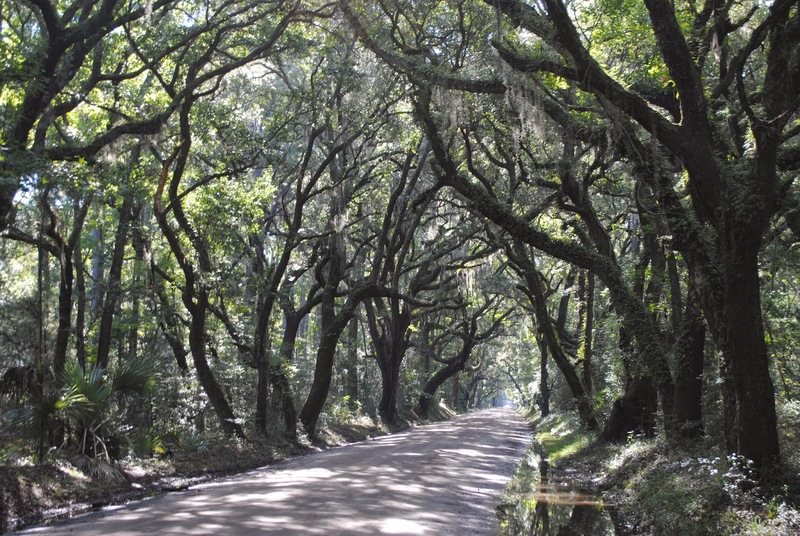 You just need to hop in your car and drive it through the breathtaking tunnel of Live Oak trees. Driving through Edisto on your way to the beach you will note that the island is comprised entirely of small African American churches. Sadly, we don't get alligators on Edisto, but the beach at "Botany Bay" is no less amazing. Unfourtanetly, this beach is super protected to the point where you are not allowed to remove anything, including sea shells. This stinks, because there are some amazing shells on the beach. Unable to take the shells home, visitors take the shells from the beach and use them to decorate the dead wood. Obsessive Compulsive beach goer take pleasure in lining the shells up into perfect rows on fallen palmetto trunks. All in all, this is one of the most amazing and tranquil places I have ever been. Since we are talking about trees, there is another spot of interest heading out of the island. This mysterious burst of color is known simply as "The Edisto Tree". For decades this spindly little tree changes decorations every season. No one knows who is changing the decorations and dressings, but the tree has its own facebook page. According to the facebook page, the tree enjoys watching Hell's Kitchen and listening to Meatloaf. Possibly related is this equally mysterious tree dressed as a Hula girl a mile down the road.